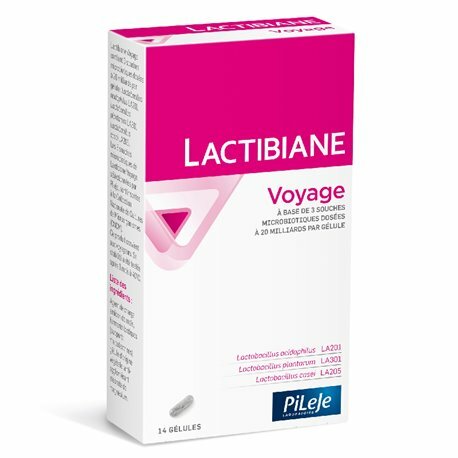 DIGESTIVE COMFORT TRAVEL PILEJE LACTIBIANE 14 CAPSULES: Food Supplement LACTIBIANE TRAVEL Laboratories PILEJE is intended to preserve the digestive comfort while traveling. Some people see appear digestive disorders when traveling: change of diet, stress are all triggers. Laboratories PILEJE offer the Food supplement with probiotics LACTIBIANE TRAVEL will be maintaining intestinal flora. Food Supplement LACTIBIANE TRAVEL contains about 20 Billion Probiotics. It is the combination of three different strains (Lactobacillus acidophilus, Lactobacillus plantarum and Lactobacillus casei) that will perfectly preserve the balance of intestinal flora and thus avoid disturbances of the digestive system. You can travel through quiet LACTIBIANE TRAVEL. This dietary supplement brings serenity and relaxation thanks to its action on the digestive and intestinal comfort of the traveler. Start taking the eve of departure to a risk area and throughout the length of stay: one capsule per day with a large glass of water, preferably 30 minutes before a meal (fasting). Filler: corn starch, lactic (carrier: maltodextrin), vegetable capsule, anti-caking agent, magnesium stearate. A pioneer in the study of probiotics contained in food supplements of the Lactibiane range , the PiLeJe laboratory has been conducting and publishing for years multiple experiments on probiotic strains , whether on their resistance to different physico-chemical conditions (viability, resistance to different environments for example) or their health impact, and thus contributes to advancing scientific research in this field. For years, the French laboratory PiLeJe has been developing protocols for the research and selection of specific probiotic strains . These processes enable him, among other things, to conduct clinical efficacy tests of PiLeJe health solutions that are always more advanced. New research perspectives are emerging, allowing for future natural therapies to be considered.